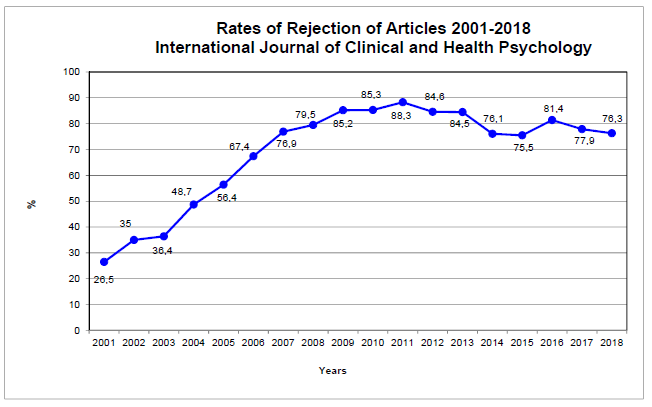 International Journal of Clinical and Health Psychology publishes manuscripts with a basic and applied emphasis, involving both theoretical and experimental areas contributing to the advancement of Clinical and Health Psychology. The Journal publishes Original Articles (empirical studies), Review Articles, Brief Reports and Case Reports. On exception the Journal publishes articles on science evaluation. Social Sciences Citation Index, SCOPUS, IN-RECS, IBECS (Índice Bibliográfico Español de Ciencias de la Salud) and Redalyc. Corresponding author: Department of Psychology, Università Cattolica del Sacro Cuore, Via Nirone, 15, 20123 Milano, Italy. Table 1. Demographics and characteristics of the study sample (N=156). Table 2. Correlations between the two mindfulness scales (LMS and FFMQ) and the considered outcomes, across the different assessment time points. Background/Objective: Depression, anxiety, fatigue, and sleep problems are typical conditions reported in people with multiple sclerosis (MS), often resulting in a reduction of their quality of life (QOL) and well-being. Mindfulness is a multifaceted and complex construct that has been increasingly explored for its correlated to well-being. Despite preliminary evidence, longitudinal data about the impact of mindfulness on QOL in MS remain limited. In addition, Langerian mindfulness, one of the prominent approaches to mindfulness, is yet unexplored in this field. The study aims to examine the longitudinal relationships between two forms of mindfulness (Langerian and contemplative) and QOL, anxiety, depression, fatigue, and sleep. Method: Within a larger randomized controlled trial of an online mindfulness-based stress reduction intervention, a cohort of 156 people with MS was recruited and assessed for both mindfulness constructs, QOL, anxiety, depression, fatigue, and sleep problems. Assessments were repeated after 2 and after another 6 months. Results: Both mindfulness constructs were highly correlated with all investigated outcomes. Both Langerian and contemplative mindfulness predicted higher QOL, lower anxiety, depression, fatigue, and sleep, over time. Conclusions: In both approaches dispositional mindfulness is a protective factor against depression, anxiety, fatigue, and sleep in people with MS.
Antecedentes/Objetivo: La depresión, la ansiedad, la fatiga y los problemas para dormir son condiciones típicas en personas con esclerosis múltiple (EM), que a menudo conllevan una reducción de su calidad de vida (CV). El mindfulness es una construcción compleja y multifacética que ha sido cada vez más explorada por su correlación con el bienestar. Sin embargo, los datos longitudinales sobre el impacto del mindfulness en la calidad de vida en la EM siguen siendo limitados. Este estudio tiene como objetivo examinar las relaciones longitudinales entre dos formas de mindfulness con la calidad de vida, la ansiedad, la depresión, la fatiga y el sueño. Método: Se contó con una muestra de 156 personas con EM y se evaluaron los constructos de mindfulness, calidad de vida, ansiedad, depresión, fatiga y problemas de sueño. Las evaluaciones se repitieron después de 2 y 6 meses. Resultados: Ambos constructos de mindfulness estuvieron altamente correlacionados con todos los resultados investigados, y ambos predijeron mayor CV, menor ansiedad, depresión, fatiga y problemas de sueño con el tiempo. Conclusiones: El mindfulness es un factor de protección contra la depresión, la ansiedad, la fatiga y el sueño en personas con EM. Multiple sclerosis (MS) is a chronic degenerative disease of the central nervous system that involves functionality of the brain and spinal cord, with physical, sensory, cognitive and emotional responses ranging from mild to severe (Ontaneda, Thompson, Fox, & Cohen, 2017). The relatively high variability in symptomatology is determined primarily by the location of the lesions in the brain and spinal cord. Lesions in the frontal and parietal lobes may result in cognitive and emotional problems; plaques in the cerebrum, brain stem and spinal cord may determine functional limitations of extremities (Rumrill, 2009). Although illness-related factors (such as neurological deterioration and functional disability) can contribute to how well the person with MS adjusts, the psychological response to the highly stressful nature of this disease is very important for the person's quality of life (QOL). In particular, the individual's beliefs regarding the uncertainty of the disease and the perceived intrusiveness on daily activities are important factors in depression, anxiety, and adjustment to the illness (Mullins et al., 2001). Depressive features are often reported by people who have MS. Lifetime prevalence of major depressive disorder is approximately 30% (Boeschoten et al., 2017), about four times the rate reported in the general population (Schürmann & Margraf, 2018; Weinberger et al., 2018) and in line with other neurological conditions (e.g., Nieto, Hernández-Torres, Pérez-Flores, & Montón, 2018). The high prevalence may have multiple etiologies, including psychosocial factors such as the difficulty to deal with one's emotions, and lack of social support (Gay, Vrignaud, Garitte, & Meunier, 2010). Depression is one of the main determinants of QOL, and may further compromise cognitive function, increase risk for suicide ideation, impair relationships and reduce compliance with disease-modifying treatments (Feinstein, 2011). In addition to research focusing on depression, people with MS have also been found to have high levels of anxiety (Wood et al., 2012). Anxiety is reported to impact between 23.5% and 44% of people with MS (Wood et al., 2013). Physical symptoms of MS vary, but fatigue and sleep problems are among the most common. About 80% of people with MS report severe fatigue impairments, and more than half of them indicate these as their most disabling symptom (Rottoli, La Gioia, Frigeni, & Barcella, 2017). Similarly, sleep problems, including sleep apnea, insomnia, and restless legs syndrome, are reported by about 70% of people with MS, although these problems are often underdiagnosed (Brass, Li, & Auerbach, 2014). Despite the symptoms, and having a major risk for mood disorders, several individuals with MS experience positive adjustment, as reflected by a high level of psychosocial well-being (Black & Dorstyn, 2015). Resilience factors that promote well-being and quality of life include social support, optimism, and spirituality (Silverman, Verrall, Alschuler, Smith, & Ehde, 2017). One of the psychological aspects that has received increasing attention in the general area of chronic illness is the construct of mindfulness (Pagnini & Langer, 2015; Pagnini & Phillips, 2015). Mindfulness is a multifaceted and complex psychological concept that can be described from different perspectives, with two major frameworks (Siegel, 2007) developed by Langer (1989) and Kabat-Zinn (1990), both in the 1970s. Langerian mindfulness is characterized by the process of active novel distinction-making, as opposed to relying on automatic categories created in the past, enabling a person to be present in the moment – that is, aware of the current context of a situation and noticing its novelties. Langer's primary components of mindfulness are novelty seeking, creativity, flexibility, and engagement (Pirson, Langer, Bodner, & Zilcha-Mano, 2012). In this approach mindfulness involves “mind-openness”, which enables the potential for possible multiple perspectives. Therefore, a mindful attitude rejects the narrow view of “good” and “bad”, as well as any other categories (including diagnostic labels). The reverse of mindfulness, mindlessness, consists of relying on previously established schemas, which prevents the ability to be in the present (Langer & Moldoveanu, 2000). Mindlessness is being entangled in a single, inflexible perspective, unaware of other possible ways of “knowing” or understanding something. Kabat-Zinn (1990) defines mindfulness as paying attention in a purposeful manner, in the present moment, and non-judgmentally. This approach focuses on awareness and lack of judgment, and is derived from the Theravada Buddhism tradition. Most mindfulness-based interventions (MBIs), including the mindfulness-based stress reduction (Kabat-Zinn, 1990) and the mindfulness-based cognitive therapy (Segal, Williams, & Teasdale, 2002), refer to this particular approach and incorporate or are based on various forms of mindfulness meditation (Perestelo-Perez, Barraca, Peñate, Rivero-Santana, & Alvarez-Perez, 2017). Despite sharing the same term of “mindfulness”, the two approaches refer to different aspects of the construct. While the contemplative definition of mindfulness is often considered an outcome (e.g., meditation practice can “lead” to mindfulness), the Langerian model focuses on the process, as Langerian mindfulness is referred as a cognitive style (Langer, 1989). Moreover, while Langer's perspective emphasizes the awareness of external stimuli, with no need to attend to one's own thought processes, the Kabat-Zinn's approach calls attention to both internal and external stimuli, requiring metacognitive and introspective awareness (Baer, 2003). In general, despite several similarities, the two models refer to different qualities of mindfulness, with the Langerian construct accentuating novelty seeking, flexibility, curiosity, and creativity, while Kabat-Zinn's approach stresses the moment-to-moment awareness, the acceptance and non-judgmental instance, and the involved meta-cognitive processes (Hart, Ivtzan, & Hart, 2013). While the Kabat-Zinn approach is the most explored version of mindfulness, there are increased concerns with a difficulty that reduces the impact of its primary therapeutic process, i.e. meditation. Specifically, and despite common acceptance of the benefits of this practice, the number of people who have tried meditation has been limited to as little as 8% (Clarke, Black, Stussman, Barnes, & Nahin, 2015), suggesting restricted potential for the scalability of meditation-based MBIs in the near future. A more thorough analysis of the meditation literature further suggests that some of the positive clinical outcomes reported may have been overestimated as a result of methodological flaws in studies included in meta-analyses (Goyal et al., 2014). Both cross-sectional investigations and studies about MBIs indicate that the Kabat-Zinn approach to mindfulness is a potentially relevant construct in the MS experience. Dispositional mindfulness was positively associated with QOL in individuals with MS (Schirda, Nicholas, & Prakash, 2015). It was also associated with fewer depressive symptoms, as it appears to be a mediator in the emotional regulation process (Schirda et al., 2015). Mindfulness also appears to be related to lower levels of pain (Senders, Yadav, & Shinto, 2014), and to play an important role in shaping dyadic adjustment in couples coping with MS (Pakenham & Samios, 2013). The impact of MBIs in individuals with MS has had some promising results. In a study by Grossman et al. (2010), 150 patients were randomly assigned to the intervention or to a usual care group. The findings indicated an improvement of QOL and a reduction of distress. The MBI group improved on non-physical dimensions (e.g., anxiety and depression) at post interventions and follow up, and baseline neuropsychological status was not related to outcome, suggesting that some form of MBI would be appropriate for many patients with MS. Although at the six-month follow up benefits remained significant, there was slippage of effects for the disease-specific quality of life and depressive symptom. That raised the question of the duration of the effects of a mindfulness intervention; no study has addressed this as of this publication. Other studies have investigated mindfulness and MS with limited samples with some methodological bias, such as the lack of an active control group. A systematic review of this topic (Simpson et al., 2014) suggested that further studies are needed to clarify how such MBIs might best serve the MS population. A randomized controlled trial recently published by our group indicate that online mindfulness-based stress reduction can improve quality of life and reduce anxiety, depression, fatigue, and sleep problems (Cavalera et al., 2018). After six months, however, results were completely gone, suggesting that constant meditation practice may be required to maintain positive results. Studies on mindfulness for people with MS have either explored the correlations of this construct with cross-sectional analyses or evaluated the effects of meditation-based MBIs. The relationship between mindfulness as an approach and well-being has not being explored in longitudinal terms, except through the lens of an MBI. In addition, Langerian mindfulness has not been explored in this field. Since Langer's approach promotes the use of simple cognitive reframing and mind-opening tasks (Pagnini, Bercovitz, & Langer, 2016; Phillips & Pagnini, 2014) and not meditation, it has the potential to overcome the limits of meditation-based MBIs. An exploration of how this construct is associated with various important psychological and physical features of MS could be highly relevant. The aim of the present study is to take a preliminary longitudinal view of exploring the well-being correlates to mindfulness using both approaches to mindfulness. The study was conducted within a larger study aimed to investigate the effects of an online mindfulness-based stress reduction (MBSR) program with an active control group (psycho-education) on the psychological well-being of people with MS. Both interventions lasted 8 weeks. The MBSR course followed the original MBSR structure, with few changes to fit the online context and to adapt MS clinical features. The psycho-educational group included 8-weekly sessions with online videos and home exercises that dealt with stress management, relaxation training, sleep hygiene, fatigue, and social relationships. The time commitment was similar to the online MBSR course. Information about the trial design is reported elsewhere (Cavalera et al., 2016). The trial results indicate that MBSR promoted higher QOL at the post-intervention assessment, but no differences between psycho-education at a 6-month follow-up (Cavalera et al., 2018). Demographic data, together with information about mindfulness, quality of life, anxiety, depression, fatigue, and sleep quality were collected from a sample of people with MS. Participants were assessed at the recruitment (T1), after 2 months (T2), which corresponds to the conclusion of the treatment), and 6 months after the end of the treatment (T3). Recruitment and assessment procedures were conducted in a hospital setting, at the Multiple Sclerosis Center of the don Gnocchi Foundation Hospital. Participants signed an informed consent. Ethical approval was obtained by the Ethics Committees of both Università Cattolica del Sacro Cuore and the Don Gnocchi Foundation. The study consisted of 156 persons with MS. Participants were considered eligible if they met the following criteria: diagnosis of MS confirmed by the neurologist; ability to communicate and understand tasks; stable pharmacological treatment for at least 3 months; no clinical relapses or use of steroid treatment during the 4 weeks before the enrolment; and over 18 years of age. Exclusion criteria were: the presence of severe co-morbidity that would reduce life expectancy to less than one year; severe neuropsychological impairment (e.g., dementia), as indicated by testing below the fifth percentile in at least 3 of 6 dimensions of neuropsychological functioning tests (i.e., attention and concentration, processing speed, executive function, verbal memory, and verbal processing); psychosis or dissociative disorders; and pregnancy. Participants were inpatients or outpatients at the Multiple Sclerosis Center of the don Gnocchi Foundation Hospital and were introduced to the study by the neurologists at the center. They were allocated either to the online MBSR or online psycho-education programs. Follow-up assessments were scheduled with the participant and provided a reminder by phone one week before. Dropout rates were limited: 156 participants completed the first assessment, 137 completed the second (19 dropouts/12%), and 115 (22 dropouts/16%) completed the entire study. Mindfulness was assessed with two questionnaires, one developed for use in the Langerian approach (the Langer Mindfulness Scale, or LMS) and one for the Kabat-Zinn approach (the Five Facet Mindfulness Questionnaire, or FFMQ). The LMS used in this study is a 14-item questionnaire that assesses three domains describing mindful thinking: novelty seeking, engagement, and novelty producing (Pirson et al., 2012). Items use a 7-point Likert scale ranging from 1 (strongly disagree) to 7 (strongly agree). The total score ranges from to 14 to 98, with higher scores reflecting higher mindfulness (Haigh, Moore, Kashdan, & Fresco, 2011). The FFMQ consists of 39 items that explore five aspects of mindfulness in accord with the original definition of Kabat-Zinn: observing, describing, acting with awareness, non-judging, and non-reactivity (Baer, Smith, Hopkins, Krietemeyer, & Toney, 2006). Each item is rated on a 5-point Likert scale (1=never true or very rarely true to 5=very often or always true). The FFMQ demonstrated good internal consistency (Baer et al., 2008). Four of the mindfulness facets (all but acting with awareness) have been shown to be significantly correlated with meditation experience. The Multiple Sclerosis Quality of Life-54 (MSQOL) questionnaire was used to assess QOL. It is a multidimensional health-related QOL assessment tool that combines both generic and MS-specific items (Vickrey, Hays, Harooni, Myers, & Ellison, 1995). For this study, we considered the mental health scale only. The Hospital Anxiety and Depression Scale was used to assess depression and anxiety. This comprises 14 items rated on a four-point Likert scale (Zigmond & Snaith, 1983). The questionnaire was designed to screen for the presence and severity of depression (HADS-D) and anxiety (HADS-A) in people with a physical symptomatology. For that reason, the scale mainly includes items that are not related to somatic symptoms of depression. The 5-item Modified Fatigue Impact Scale (MFIS-5;Kos et al., 2005) was used to measure fatigue. Higher scores indicate a greater impact of fatigue on physical, cognitive and psychosocial functioning. Sleep quality was assessed with the Medical Outcomes Study-Sleep Measure (MOS-SM;Mendozzi, Tronci, Garegnani, & Pugnetti, 2010). This instrument is composed of ten items, using a six-point Likert scale to record the frequency of occurrence in the previous 4 weeks of symptoms and difficulties typically affecting sleep and daytime activities of people with chronic illnesses. It provides a synthetic index, for which higher scores indicate more sleep problems. Statistical analyses were conducted on both cross-sectional and longitudinal data. A within-subjects was conducted, with group distinctions (MBSR vs. psycho-education) considered only to compare possible different trends. Cross-sectional associations between mindfulness, expressed by both the LMS and the FFMQ, and the other considered outcomes (QOL, depression, anxiety, fatigue, and sleep) were analyzed for each assessment time. Correlations were assessed with two-tailed Pearson correlation coefficient (r). The relationship between mindfulness, with both approaches considered independently, and the target outcomes was explored with linear mixed models (Field, 2013). Time points were formatted as time-variant to consider changes over time, and random effect was used to account for intra-subject variability. The covariance matrix was considered as auto-regressive (ARI), with heterogeneous variances at the three assessment times – i.e., the matrix with the fewest parameters whose “deviance” was not significantly different from the “unstructured” covariance matrix (Heck, Thomas, & Tabata, 2013). Models resulting from the analysis of the associations between the two mindfulness scores and the target outcomes were compared with chi-squares for each outcome. Data were analyzed with SPSS and R software. Descriptive statistics, including demographic information, means, standard deviations, and ranges for the considered outcomes at T1 are reported in Table 1. Demographics and characteristics of the study sample (N=156). Note. LMS, Langer Mindfulness Scale; FFMQ, Five Facet Mindfulness Questionnaire; MSQOL, Multiple Sclerosis Quality of Life-54; HADS-A/D, Hospital Anxiety and Depression Scale; MFIS-5, Modified Fatigue Impact Scale; MOS-SM, Medical Outcomes Study-Sleep Measure. All the investigated outcomes resulted correlations at each assessment time, with both the LMS and the FFMQ, with the exception of the MOS-SM and the LMS at T1 and T2. Correlations are reported in Table 2. Correlations between the two mindfulness scales (LMS and FFMQ) and the considered outcomes, across the different assessment time points. Note. LMS, Langer Mindfulness Scale; FFMQ, Five Facet Mindfulness Questionnaire; MSQOL, Multiple Sclerosis Quality of Life-54; HADS-A/D, Hospital Anxiety and Depression Scale; MFIS-5, Modified Fatigue Impact Scale; MOS-SM, Medical Outcomes Study-Sleep Measure; Sig., significant; correlations are 2-tailed. When separately conducted, the analyses on both groups (MBSR and psycho-education) did not provide significant differences. Reported results therefore refer to the overall sample. Results from mixed models indicate that for both constructs the mindfulness scores are associated with higher QOL, lower depression, lower anxiety, lower fatigue, and lower sleep problems (see Figure 1). Associations between LMS/FFMQ and the considered outcomes, divided by different assessment time points. Specifically, the LMS predicted higher values, adjusted for time, of the MSQOL, F(1, 405.52)=21.16, p<.001. Conversely, it predicted lower scores of: HADS-A, F(1, 319.57)=19.10, p<.001; HADS-D, F(1, 398.81)=18.78, p<.001; MFIS-5, F(1,458.99)=15.58, p<.001; and MOS-SM, F(1, 515.07)=4.16, p=.042. Similarly, FFMQ scores predicted similar outcomes: higher MSQOL scores, F(1, 284.05)=12.31, p=.001, and lower scores with HADS-A, F(1, 296.21)=30.999, p<.001; HADS-D, F(1, 411.52)=39.03, p<.001; MFIS-5, F(1, 1414.81)=17.25, p<.001; and MOS-SM, F(1, 323.71)=16.37, p<.001. Additional parameters of the models are presented in Table 3. Note. LMS, Langer Mindfulness Scale; FFMQ, Five Facet Mindfulness Questionnaire; MSQOL, Multiple Sclerosis Quality of Life-54; HADS-A/D, Hospital Anxiety and Depression Scale; MFIS-5, Modified Fatigue Impact Scale; MOS-SM, Medical Outcomes Study-Sleep Measure; SE, standard error; CI, confidence interval. Comparing the models resulting from the two mindfulness instruments (LMS and FFMQ) for each outcome, no statistical differences were found. The present study investigated the relationship between the two different mindfulness approaches described above and both psychological and physical well-being outcomes in people with MS. These results indicate that mindfulness as defined in both the Langerian and Kabat-Zinn approaches are associated with higher quality of life, lower depression and anxiety, lower levels of fatigue, and better sleep. Longitudinal analyses suggest that mindfulness in both forms can predict these outcomes over time. These results are in line with the construct of mindfulness as a protective factor against stress, also previously explored in cross-sectional studies (Schirda et al., 2015). The identification of stable patterns over time suggests that mindfulness can exert a positive effect on the improvement of psychological well-being. Further, a mindful attitude predicts higher sleep quality and lower fatigue. This is in line with previous studies that investigated the effect of an MBI on several outcomes, including sleep quality and fatigue (Pagnini, Bosma, Phillips, & Langer, 2014). The results confirm and extend the importance that mindfulness can have on the general quality of life of people with MS including meditation-based approaches and, for the first time, the same results using the Langerian mindfulness framework. As expected, there was a strong correlation between the two forms of mindfulness, with similar impacts on well-being. Despite the theoretical differences between the two models, they both refer to one construct, approached from two different perspectives. There is a clinical implication, however, that could be relevant. Even though the two approaches ultimately refer to different facets of mindfulness, the ways to work on the different facets are not similar. While the scientific community applauds meditation-based interventions, they may be hard to scale – particularly in settings focused on individuals with chronic illnesses that are less susceptible to the relatively highly focused concentration requirements of meditation or the logistical aspects of most current meditation-based MBIs (Pagnini & Phillips, 2015). The Langerian approach does not involve meditation and is framed as a set of techniques or skills that can be transmitted through educational sessions that employ simple cognitive reframing exercises (Carson & Langer, 2000). Langer reported that improving on mindfulness is very simple (Langer, 1989) and it does not require the vast amount of time of a structured meditation training. The further exploration of mindfulness training based on this approach for these types of patients is therefore warranted. The present study includes several limitations that to varying degrees restrict the results. Although the sample size was higher than most, if not all, studies conducted in the field of MS about mindfulness, it was still relatively small. All of the assessed outcomes were also self-reported, with the possibility that fatigue and sleep quality measures could be objectively different than perceived by the participants. Future studies could benefit from including instrumental and day-to-day evaluations, such as actigraph units and ecologically momentary assessments. Finally, there is an intrinsic issue with mindfulness assessment as it could be a problematic concept for declarative knowledge, potentially a confounding effect of metacognition abilities (Bercovitz, Pagnini, Phillips, & Langer, 2017; Brown, Ryan, & Creswell, 2007). Despite its limitations, the present study provides a potentially significant basis of support for mindfulness as a relevant construct for people with MS. The effects that a mindful outlook promotes over time include higher psychological well-being and QOL, a reduction in anxiety, depression, perceived fatigue, and sleep problems. Mindfulness can be addressed from multiple perspectives. The two major ones that were explored in this study lead to similar outcomes. This could be particularly relevant for the exploration of alternative approaches to mainstream non-meditation-based MBIs, matching or potentially outpacing the limits of a meditation approach for some cohorts and represents a promising research area for future clinical studies. This project was funded by a grant from Fondazione Italiana Sclerosi Multipla, Italian private foundation (FISM Research Grant 2013/R/17). We sincerely thank Anna Vaccari, Gina Pongolini, and Paula Oneto for the linguistic support. Mindfulness training as a clinical intervention: A conceptual and empirical review. R.A. Baer, G.T. Smith, J. Hopkins, J. Krietemeyer, L. Toney. Using self-report assessment methods to explore facets of mindfulness. R.A. Baer, G.T. Smith, E. Lykins, D. Button, J. Krietemeyer, S. Sauer, E. Walsh, D. Duggan, J.M.G. Williams. Construct validity of the five facet mindfulness questionnaire in meditating and nonmeditating samples. K. Bercovitz, F. Pagnini, D. Phillips, E. Langer. Utilizing a creative task to assess Langerian mindfulness. A biopsychosocial model of resilience for multiple sclerosis. R.E. Boeschoten, A.M. Braamse, A.T. Beekman, P. Cuijpers, P. van Oppen, J. Dekker, B.M. Uitdehaag. Prevalence of depression and anxiety in multiple sclerosis: A systematic review and meta-analysis. S.D. Brass, C.-S. Li, S. Auerbach. The underdiagnosis of sleep disorders in patients with multiple sclerosis. K.W. Brown, R.M. Ryan, J.D. Creswell. Addressing fundamental questions about mindfulness. Mindful practice for clinicians and patients. C. Cavalera, F. Pagnini, M. Rovaris, L. Mendozzi, L. Pugnetti, M. Garegnani, E. Molinari. C. Cavalera, M. Rovaris, L. Mendozzi, L. Pugnetti, M. Garegnani, G. Castelnuovo, E. Molinari, F. Pagnini. T.C. Clarke, L.I. Black, B.J. Stussman, P.M. Barnes, R.L. Nahin. Trends in the use of complementary health approaches among adults: United States, 2002–2012. Discovering statistics using IBM SPSS statistics. M.C. Gay, P. Vrignaud, C. Garitte, C. Meunier. Predictors of depression in multiple sclerosis patients. M. Goyal, S. Singh, E.M. Sibinga, N.F. Gould, A. Rowland-Seymour, R. Sharma, Z. Berger, D. Sleicher, D.D. Maron, H.M. Shihab. Meditation programs for psychological stress and well-being: A systematic review and meta-analysis. P. Grossman, L. Kappos, H. Gensicke, M. D'Souza, D.C. Mohr, I.K. Penner, C. Steiner. MS quality of life, depression, and fatigue improve after mindfulness training: A randomized trial. E.A.P. Haigh, M.T. Moore, T.B. Kashdan, D.M. Fresco. Examination of the factor structure and concurrent validity of the Langer Mindfulness/Mindlessness Scale. R. Hart, I. Ivtzan, D. Hart. Mind the gap in mindfulness research: A comparative account of the leading schools of thought. R.H. Heck, S.L. Thomas, L.N. Tabata. Multilevel and longitudinal modeling with IBM SPSS. Full catastrophe living: Using the wisdom of your body and mind to face stress, pain, and illness. D. Kos, E. Kerckhofs, I. Carrea, R. Verza, M. Ramos, J. Jansa. Evaluation of the Modified Fatigue Impact Scale in four different European countries. L. Mendozzi, F. Tronci, M. Garegnani, L. Pugnetti. Sleep disturbance and fatigue in mild relapsing remitting multiple sclerosis patients on chronic immunomodulant therapy: An actigraphic study. L.L. Mullins, M.P. Cote, B.F. Fuemmeler, V.M. Jean, W.W. Beatty, R.H. Paul. Illness intrusiveness, uncertainty, and distress in individuals with multiple sclerosis. A. Nieto, A. Hernández-Torres, J. Pérez-Flores, F. Montón. Depressive symptoms in Friedreich ataxia. D. Ontaneda, A.J. Thompson, R.J. Fox, J.A. Cohen. Progressive multiple sclerosis: Prospects for disease therapy, repair, and restoration of function. F. Pagnini, K. Bercovitz, E. Langer. Perceived control and mindfulness: Implications for clinical practice. F. Pagnini, C.M. Bosma, D. Phillips, E. Langer. Symptom changes in multiple sclerosis following psychological interventions: A systematic review. Mindful reappraisal: Comment on “mindfulness broadens awareness and builds eudaimonic meaning: A process model of mindful positive emotion regulation”. Couples coping with multiple sclerosis: A dyadic perspective on the roles of mindfulness and acceptance. L. Perestelo-Perez, J. Barraca, W. Peñate, A. Rivero-Santana, Y. Alvarez-Perez. Mindfulness-based interventions for the treatment of depressive rumination: Systematic review and meta-analysis. A mindful approach to chronic illness. M. Pirson, E. Langer, T. Bodner, S. Zilcha-Mano. The development and validation of the Langer Mindfulness Scale-Enabling a socio-cognitive perspective of mindfulness in organizational contexts. M. Rottoli, S. La Gioia, B. Frigeni, V. Barcella. Pathophysiology, assessment and management of multiple sclerosis fatigue: An update. Multiple sclerosis: Medical and psychosocial aspects, etiology, incidence, and prevalence. B. Schirda, J.A. Nicholas, R.S. Prakash. Examining trait mindfulness, emotion dysregulation, and quality of life in multiple sclerosis. Age of anxiety and depression revisited: A meta-analysis of two European community samples (1964–2015). Z. Segal, J.M.G. Williams, J.D. Teasdale. Mindfulness-based cognitive therapy for depression: A new approach to preventing relapse. A. Senders, V. Yadav, L. Shinto. The relationship between mindfulness and pain in multiple sclerosis. A.M. Silverman, A.M. Verrall, K.N. Alschuler, A.E. Smith, D.M. Ehde. Bouncing back again, and again: A qualitative study of resilience in people with multiple sclerosis. R. Simpson, J. Booth, M. Lawrence, S. Byrne, F. Mair, S. Mercer. Mindfulness based interventions in multiple sclerosis – A systematic review. B. Vickrey, R.D. Hays, R. Harooni, L.W. Myers, G.W. Ellison. A health-related quality of life measure for multiple sclerosis. A. Weinberger, M. Gbedemah, A. Martinez, D. Nash, S. Galea, R. Goodwin. Trends in depression prevalence in the USA from 2005 to 2015: Widening disparities in vulnerable groups. B. Wood, I. Van Der Mei, A. Ponsonby, F. Pittas, S. Quinn, T. Dwyer, B. Taylor. Prevalence and concurrence of anxiety, depression and fatigue over time in multiple sclerosis. B. Wood, I. Van Der Mei, A.-L. Ponsonby, F. Pittas, S. Quinn, T. Dwyer, B. Taylor. The hospital anxiety and depression scale.